Our #1 priority is you, the customer. We believe in our product and hold ourselves to the highest standards. We truly care about your business as much as you do, which is why we offer the best support around at our dedicated support center. 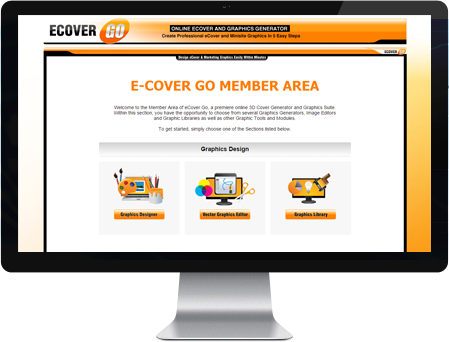 In addition, eCover Go constantly offers updates with new graphics and modules requested by our customers. You can count on us. The eCover Go is loaded with useful graphic and site design tools. We listen to our customers and integrate their feature requests on a regular basis. eCover Go is not only built by us, but also by our customers! Choose from over 200 Cover Types in 72dpi and more than 50 Cover Types in 300dpi High-Resolution Quality. Design Your Logos and Kindle Cover. Over 100 Logo Templates and a growing archive of Kindle Cover Templates. Access the ever growing Graphics Library with thousands of Cliparts, Photos and Graphical Design Elements. Instantly Render 3D Cover Graphics and apply professional Effects to your Photos and Images. Contact the Support Department if you have any questions about the eCover Go Graphics Suite. We are fully dedicated to our customers! When you sign up for eCover Go, there is no need to worry about customer support. With over 1000 customers and counting, you cannot go wrong. Check out what our users are saying about eCover Go! My first reaction to this product was “wow” and that was before I had gone though several of the features, as somebody who has been in the design/publishing Industry for many years, I found this extremely impressive with many features and useful tools, from design point of view you can know design anything you want with premade templates or design your own, there are far to many things to mention here, but you can design, business cards, banners, e book covers, video player generator, anything you want… splash pages, graphics, price tables, qr codes, it goes on and on, there are great bonus downloads, video and audio clips, and much more, for anybody wanting to get into graphics or design this is a must, for people who want to improve the look of their website, banners etc you couldn’t get better than this. I cannot praise this product enough; the work that has been done developing it is fantastic. Highly recommended by me. Great Work Thomas. Hi Everyone! I had the pleasure to receive a review copy of Thomas software and let me tell you it ROCKS! You can do virtually anything related to IM design with this… Although I’m not at all a web designer myself, the functions are simple enough to accomplish design work even for a complete newbie. Of course, seasons designers will found this tool really helpfull as well… Whether you need to design minisites, banners (static or animated), headers, favicons, business cards, mobile sites, videos, etc (it does too many things to list them all! Lol! )… This software makes it all, the easy way… Anything an internet marketer or a web designer could need is there, ready to use withouth any complex learning curve…. Never mind the awesome images and icons librairies… If you need something like this, don’t hesitate cause it’s an high end product and I highly recommend it! Thanks a lot Thomas! Absolutely GORGEOUS! I use different graphics programs and software everyday in my business and this is definitely worth every penny. If your looking for a photoshop clone, you may be a little disappointed. However, it can still do almost all of the photo editing anyone in IM would need. There are tons of different modules to accomplish nearly anything IM related from photo editing, graphics (HUGE ASSORTMENT), Video player creation, and all the way down to business cards with templates. Excellent job man.. and well worth the investment! I was more than happy to review this. It has taken me a long time to write this review because there was sooooo much to check out!! You can spend a week at eCover-Go.com and still not see all that is available. This is a Graphic Design Paradise. If you can’t make it here, hang it up and forget it! Thomas has put together the most comprehensive collection of graphic tools I have ever seen. I found them to be very intuitive. Even the newest newbie will be able to come up with professional looking designs. More advance marketers will also be impressed. eCover-Go may not replace Photoshop, but it is coming close with all the features available. It is just fun to play around with all the modules! This will most likely become one of the most active membership sites online. And if all that isn’t enough, there is a Bonus Section with free minisites, websites, royalty free music and video loops and more. I’d advise everyone to purchase this before Thomas comes to his senses and starts charging what a membership in eCover-Go is really worth! Thanks for the opportunity to review your site! Join Over 1000+ Satisfied eCover Go Customers! Adobe® and Adobe Photoshop® are trademarks of Adobe Systems Incorporated and iPod® and iPhone® is a registered trademark of Apple, Inc neither are associated nor affiliated with TBIT DESIGN, Inc. in any way.